In the crucible of the present recession, one expects cruise lines to get into trouble, and a few have. Hebridean has gone into receivership and joined stable mates Swan Hellenic and Voyages of Discovery in the portfolio of All Leisure. The river operations of Majestic America and Peter Deilmann have either gone or are being wound down. And Windstar's parent Ambassadors International has announced that it will need more cash in order to stay in business. While Carnival and NCL are making a profit Royal Caribbean is losing money. The last thing we might expect right now is the announcement of two new cruise lines in one week. But that is precisely what has just happened. And both lines, each of which is branded with the name "voyages," has some rather interesting background. Last Thursday, Cruise & Maritime Services of Dartford, Kent, announced that in 2010 it would be starting a new two-ship cruise operation under the brand and trading name of Cruise & Maritime Voyages. Cruise & Maritime have been around for some time and have a lot of experience in the small traditional ship and regional UK markets, as well as in operating cruise ships from Tilbury. Headed by former CTC Cruises executives Richard Bastow and Chris Coates, Cruise & Maritime has worked over the past several years with various European operators, including Classic International Cruises of Lisbon, Louis Cruise Lines of Nicosia and Transocean Tours of Bremen, in building a following in the UK market. The new line's first ship, the 820-berth Marco Polo, they have been marketing for the past two summers under the brand of Transocean Tours. The Marco Polo was purchased by the Greek-based Global Maritime Group in 2007 and chartered to Transocean to replace the Louis Cruise Lines' Arielle, which is now operating from Piraeus as the Aquamarine. Both ships had been used in Transocean's program of Tilbury cruises and marketed by Cruise & Maritime. Cruise & Maritime have a lot of experience with Tilbury, which was the UK base port for the Russian and Ukrainian-owned ships operated by CTC. 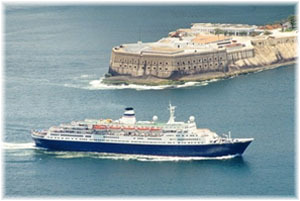 The Marco Polo's first Cruise & Maritime departure will take place on January 2, 2010, at she start of a five-year charter. She will now operate from the UK year-round. Ironically, the Marco Polo was well-known to Coates and Bastow as the Alexandr Pushkin, when she operated in the Tilbury-Montreal Transatlantic trade of the then-Leningrad-based Baltic Shipping Company, which was marketed in the UK by CTC Cruises. The line's second ship is the 800-berth Ocean Countess, a ship that was familiar to Brits for many years as the Cunard Countess. Unlike the Marco Polo, which will concentrate on Tilbury, the Ocean Countess will operate from UK regional ports, including Hull, Newcastle, Edinburgh, Greenock, Liverpool and Plymouth. Starting on April 18, 2010, these regional cruises come at a good time as although Fred. 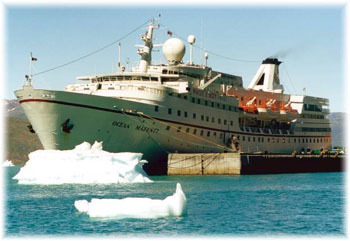 Olsen will be continuing their regional cruises with the Boudicca, Thomson Cruises will not have any UK departures in 2010 and Page & Moy, although they also have programs with Costa and Louis, will no longer be operating the Ocean Majesty. Cruise & Maritime will charter the Ocean Countess from Majestic International (who also control the Ocean Majesty) on an initial two-year charter, and Cruise & Maritime have appointed Global Maritime to supply hotel, marine and entertainment management programs so there will be consistency of product between the two ships. Cruise & Maritime also have a lot of experience with the rather segmented UK regional and small ship market, where various tour operators commit to one or two voyages each and the ship passes from operator to operator over the summer, each with its own loyal clientele and database. This kind of operation is unheard of in North America but has had a place in Europe for years. Just as in smaller markets such as Sweden, Belgium and Ireland, where there is not enough business to support their own cruise lines, the same is true in this segment of the UK market. In the past, Cruise & Maritime have been quite adept at marketing such programs. "We all collectively believe that despite the significant increase in the larger resort style vessels, the reducing number of smaller, traditional and lower capacity vessels generally operated by the independent and privately owned shipping companies, still have a huge following on the British market. "We believe this potentially enables us to deliver a more personal and friendly standard of service and our vessels can also visit more remote ports of call and places not always accessible to the larger resort ships." One interesting aspect of this news is that Transocean Tours will now be left with just one ship, the Astor, instead of the three they had operated at one stage. As well as the Marco Polo, the Astoria, which once operated for Transocean, has been purchased by Saga as their Saga Pearl II. On the very next day to the Cruise & Maritime news it was announced that another new cruise line, to be called Voyages to Antiquity, is being launched by Gerry Herrod. 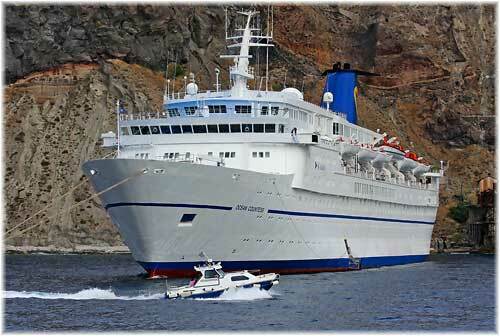 Voyages to Antiquity has acquired the 560-berth Aegean I, to be renamed Aegean Odyssey. She will sail the Mediterranean on two-week cruises from May to November. Gerry Herrod is the serial cruise entrepreneur who started up and then sold Ocean Cruise Line (and its subsidiary Pearl Cruises) in 1990 to Paquet Cruises, Orient Lines in 1998 to Norwegian Cruise Line, and Discovery Cruises in 2005 to All Leisure, who operate it as Voyages of Discovery and have since acquired Swan Hellenic and Hebridean Island Cruises. With Voyages to Antiquity, Herrod is involved in his fourth cruise line start-up. This new line's ship, the Aegean Odyssey, is already known to many as she operated for a little while as the Aegean I for Renaissance Cruises and has also been active in the short cruise market out of Piraeus. Ironically, however, one of the ships involved in the new Cruise & Maritime venture, the Marco Polo, is also a Gerry Herrod project as it was he who converted and renamed her for his Orient Lines in 1993. Herrod is recrafting the Aegean I into the 382-guest Aegean Odyssey at a shipyard in Greece. The upper level accommodation will be enlarged and forty-two balcony suites will be added, while the ship will also have sixteen single cabins. Dining will be open-sitting in the main restaurant and alternative dining will be available at the Terrace Cafe and Tapas on the Terrace. The ship is due to enter service in April 2010. She will operate a series of two-week Mediterranean itineraries put together by historian John Julius Norwich, author of "The Middle Sea," who will also be among the on board guest lecturers, and her crew will also include a number of young historians. Half the passengers are expected to come from the UK, where Voyages of Antiquity has opened as office in Oxford under David Yellow, formerly of Ocean Cruise Lines, Orient Lines and Voyages of Discovery, and half from North America, where the line is opening an office in Fort Lauderdale, headed by Mitchell Schlesinger and Andre Corman, both of whom once worked for Orient Lines. Cruise fares will include a choice of excursions in every port, Mediterranean wines with dinner, and gratuities for cabin stewards and dining room staff. According to Herrod, the ship will be ideal for "those who dislike travelling around with hordes of people" and is aimed at a more upmarket and sophisticated audience, including former followers of Orient Lines. Daily fares will apparently range between $295 and $425 per day. The big loser here seems to be Wayne Heller, of Orlando-based Cruises Only, who bought the Orient Lines name from Star Cruises last August intending to utilise the former Maxim Gorkiy as Marco Polo II, but then in November postponed the start-up because of the recession. The Gorkiy has since gone to the scrap yard and not only has a new line come along to solicit the Orient Lines market in Voyages of Antiquity, but a revived Swan Hellenic is now on the scene as well. Another operator, Martin Randall Travel of London, chartered Hapag-Lloyd's Columbus for three Mediterranean cultural cruises in 2008 and will take her again between September 20 and November 5 for four more cultural cruises. But in announcing that they would not operate any such cruises in 2010, Martin Randall Travel said "While we are making many changes to the established model of 'discovery' cruising in matters of detail and emphasis, we cannot claim that the project is particularly innovatory." Elsewhere, the Paquet cruise brand is to be revived in France by Jean-Maurice Ravon through his company TMR. TMR will charter the 820-berth Costa Allegra. As Costa control the Paquet brand they seem to have come to an agreement with Ravon to market the ship under the revived brand name in an attempt to test the French market against Royal Caribbean's Croisi�res de France and their 800-berth Bleu de France. But two new brands in a small market may help it grow. Although France has a long maritime history, its inhabitants seem to be among the most reluctant to embrace cruising. Clearly, the winners in these developments are those that like smaller and more traditional ships. While Cruise & Maritime Voyages will be going after a more unpretentious market than Voyages of Antiquity, they will all win by being able to travel on ships that carry only hundreds of passengers and can offer a more personal service than the big new floating resorts that now carry thousands.